This weekend some of our members will be attending a leadership conference at Wright State University in Ohio. During this conference, students will attend programs that will allow them to learn more about programs and leadership. Good luck to our conference team, we can’t wait to hear all about it! Join Diversity Peer Educator’s and Residence Hall Association for our Open Mic Spook-Out Against Domestic Violence this Wednesday at 5:30! 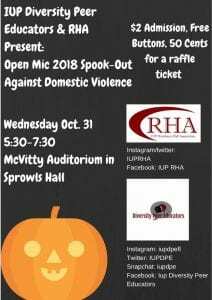 This will take place in McVitty Auditorium in Sprowls Hall. Admission is $2’s and raffle tickets are 50 cents each! Thanks to all who attended all of our weekend events including Halls of Horror, Rocky Horror Picture Show, and Hallow-Fest! We love interacting with all of the students around campus and we can’t wait to see you all at our events in the future! Make sure you follow RHA on our social media platforms to get to know our members and to get more information on our events happening around campus! Our mission is to promote the general welfare of the students living in the residential community by providing opportunities for educational and social growth, scholastic achievement, recreational activities, and to serve as a liaison between the residents and the Office of Housing, Residence Life, and Dining. All students of IUP who have applied and received acceptance to reside within a residence hall are considered a member of RHA, provided that the decision of active membership will be left up to the resident.